To continue to provide excellence in customer service and quality outcomes for our clients within scheduled timeframes and budgets. We do this through our commitment to, professional business practice and systems, training, education and leading technology, and quality management. 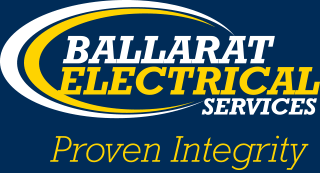 Ballarat Electrical Services (formerly G and D Holmes Electrical), is an established Commercial, Domestic and Rural electrical contracting business that has been servicing Ballarat and regional Victoria for over 40 years. Founded by Geoff Holmes in 1973, the business traded as, G and D Holmes Electrical, until 2013 when the organization took on the new name of "Ballarat Electrical Services." The business has a new name but the focus of delivering excellence in customer service and quality outcomes remains as strong today as it did 40 years ago. As testament to the integrity, quality and service provided by Ballarat Electrical Services, many of the clients who Geoff completed work for in the 1970's, still use our services today. Ballarat Electrical Services employs fully certified technicians holding current Electrical licenses and offers a complete range of services to cater to all needs. Ballarat Electrical Services has an impeccable reputation for delivering exceptional outcomes for its clients. The team at Ballarat Electrical Services are proud of our strong reputation as a business built on quality, integrity and excellent customer service.